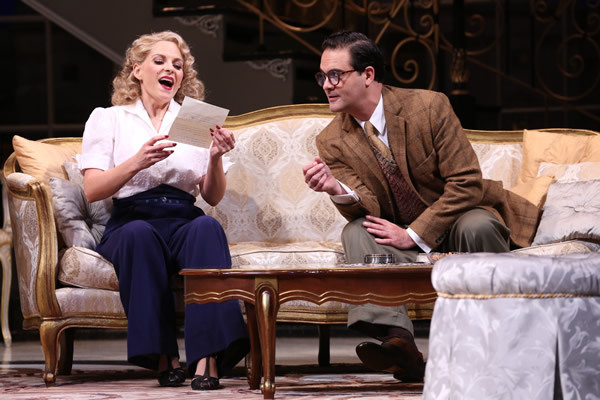 Part comedy and part civics lesson, Garson Kanin’s 1946 Broadway hit “Born Yesterday” follows the doings of a vulgar millionaire who storms Washington to grease palms and deregulate the scrap iron industry. It’s a familiar story that could have happened 50 years ago or this morning. Director Aaron Posner mounts a faithful yet relevant revival at Ford’s Theatre overlooking nothing in recreating the look and feel of postwar Washington. Nothing is amiss from set designer Daniel Lee Conway’s sumptuous hotel suite where tycoon Harry Brock and dim girlfriend Billie Dawn make camp to Kelsey Hunt’s divine 1940s costumes including Billie’s garter belts, a Senate wife’s smart navy suit and hat and Harry’s double-breasted pinstripe gangster suit to Anne Nesmith’s spot-on hair design. And then there’s the excellent cast of familiar faces led by Edward Gero as Harry and Kimberly Gilbert as Billie. Cody Nickell plays Paul Verrall, a hotshot magazine writer assigned to profile Harry, and Eric Hissom is Ed Devery, Harry’s once-virtuous-but-now-shady attorney, who deadens his feelings with copious amounts of liquor. The stalwart supporting cast includes Evan Casey as Eddie Brock, Harry’s flunky cousin; Todd Scofield as unprincipled Sen. Norval Hedges; and Naomi Jacobson who plays both proper Mrs. Hedges and a wisecracking chamber maid contemptuous of the one percent. A self-made junkman, Harry is used to getting what he wants. He “got” Billie from the chorus and now he wants to buy a United States senator for a good price. Once ensconced in temporary digs, Harry reluctantly meets with journalist Verrall. He takes a shine to the smug but idealistic writer and hires him to “smarten up” Billie. The idea is to make the ex-showgirl more palatable to D.C. society. Here’s where “Born Yesterday” becomes a romantic Pygmalion tale too. Verrall challenges his new student with a stiff curriculum. Impressed with her cute tutor, Billie gives it her best shot. In no time, she’s visiting book shops and galleries. Her chaise is surrounded by stacks of books. Billie’s reading list covers everything from the daily papers to the works of patriot Thomas Paine. She improves her speech, but most of the improvements are internal. Soon, the kept woman realizes she has more to offer than her body. Billie also develops a critical eye. She grows tired of people “taking it.” And she learns that it’s time for the individual to stick up for him or herself in everyday life and as citizens. Billie can’t understand why a guy with money gets to strongarm a Senator who’s representing a vast constituency. Conversely, Harry can’t fathom why his mink-clad girlfriend would question his methods. Judy Holliday shot to stage stardom playing Billie. She went on to earn an Academy Award for her comedic turn in the screen version. There are echoes Holliday in Gilbert’s New Yawkese but the local actor makes the part her own, whether airily dancing around the suite singing bits from Cole Porter’s “Anything Goes,” Billie’s last gig before hooking up with Harry, or aggressively going after the next man that strikes her fancy. Ultimately, her transformation from complacent courtesan to thoughtful woman is convincing. And Gero’s Harry is an unschooled guy who happens to have a big brain for business at which he ruthlessly succeeds. With mouth agape and a bruiser’s protruding bottom lip, his Harry is a charming lug, that is until he slugs an increasingly uncooperative Billie. “Born Yesterday” gets a bit didactic, but it’s more feel-good than anything else. Sadly, the very things that playwright Kanin rails against are perhaps more prevalent in American political life today than ever before.